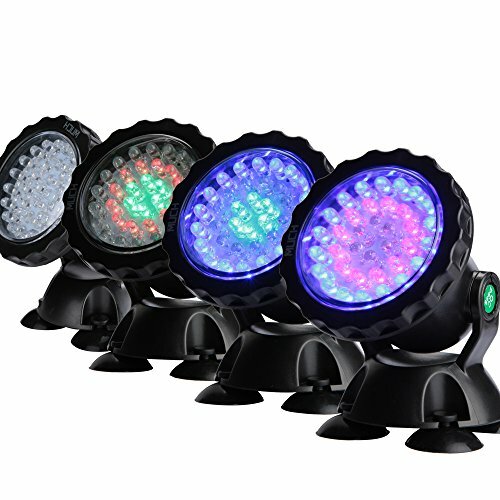 MUCH Underwater Light, Waterproof IP 68 Submersible Spotlight with 36-LED Bulbs 7W Multi-Color Spot Light for Aquarium Garden Pond Pool Tank Fountain Waterfall （Set of 4） | Fountain City Art Ctr. MUCH Underwater Light, Waterproof IP 68 Submersible Spotlight with 36 LED bulbs brings you more pleasure in summer nights! * 8 - 10 hours of focus lighting continuously. * 36 LED bulbs, 7 patterns change every 1 - 2 seconds. * DC 12 V working voltage, safe and reliable for human and fish. * You can rotate the irradiation angle arbitrarily, fully adjustable 180° articulation. If you have any questions about this product by MUCH, contact us by completing and submitting the form below. If you are looking for a specif part number, please include it with your message.